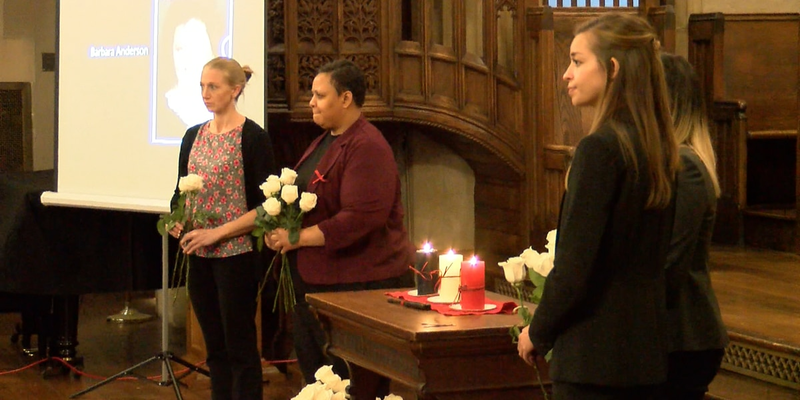 WILMINGTON, NC (WECT) - On Friday night, a candlelight memorial honored homicide victims in southeastern North Carolina. Law enforcement, first responders, victims' families, district attorneys, faith leaders, and more gathered for the 23rd Annual Homicide Memorial Service at First Presbyterian Church in Wilmington. "There is power in coming together, and there is power in sharing experience, and that is really the magic of what this night is all about," said District Attorney Jon David. Birdie Frink organized the first memorial service after her daughter, Amy Caroline, was murdered in June 1994. At this year's memorial, the names of 223 victims were read aloud. A white rose symbolizing forgiveness was handed out to people attending on behalf of a loved one who was killed. The memorial service was held before Thanksgiving to help families who will have an empty seat at the table, said David. Three candles were lit in succession honoring fallen law enforcement, firefighters, and military. Almira Jones shared this year’s Voice of a Victim. Jones lost her son, Larry, who was shot and killed in 2015. "Celebrate and remember the good times our loved ones gave us," said Jones. Her son aspired to a career as a welder and was known for his sense of humor. A projector displayed the names and pictures of each victim honored at the memorial. “For us gathered here, seeing that on the screen, it’s a reminder, of course, and then at the same time, being where we are in the sanctuary, it’s really a healing process,” said Frink. The event ended with a message of hope and benediction. WECT’s Jon Evans served as emcee of the memorial service. A Wake County superior court judge had ordered a Lexington-based tree removal company to pay thousands of dollars in restitution and fines after accusations of price gouging in the Wilmington area following Hurricane Florence.